The tariffs are valid from 1.1.2019. Port of Hanko Ltd. reserves the right to make changes in the tariffs. All charges specified in this Schedule of Charges are exclusive of value added tax (VAT). VAT is added to the charges according to the valid VAT rate whenever the charge is subject to VAT according to law and/or decisions by public authorities. Penalty interest for amounts overdue is calculated as specified in Section 3 (2) of the Interest Act. From the beginning of 2017 we will add an invoicing fee for invoices that are smaller than 10,00 €. The fee will be 8,00 €/invoice. Cargo charges are levied on goods transported by sea via the Port of Hanko as specified in the tables below. Unless otherwise agreed, the charges shall be paid by the Finnish holder of the cargo, the agent of the vessel, the shipping company or the party responsible for the goods transported. Those liable for payment shall provide the Port with the information required for determining the amount payable. Unless otherwise specified in this Schedule of Charges, cargo charges are based on gross tonnage. e. containers, pallets and other articles of transport equipment that themselves are not merchandise but are intended to facilitate the carriage of goods. All merchant vessels calling at the Port of Hanko shall pay vessel charges as specified in this Schedule of Charges. 1. Where the vessel due is based on the vessels’ net tonnage, the charge shall be levied on the basis of the full net tonnage specified in the vessel’s Tonnage Certificate. 2. In case a vessel’s net tonnage is changed while in the port, the highest net tonnage shall apply. 3. The captain or agent of the vessel shall submit the data required for the determination of the amount payable to the port authorities. 4. The payment of the vessel due entitles to seven days’ uninterrupted stay in the port area or at the anchorage place next to the harbour area. Vessel due is charged for each starting seven days period. The payment includes one shift from a harbour area to another. 5. For special reasons, discounts on the charges can be granted or a vessel can be exempted from charges. 6. Vessels using the Port of Hanko as their base (trawlers, tugboats, water buses, Finnish passenger vessels etc.) shall be charged a separate quay rent. 7. Port of Hanko Ltd. reserves the right to decide the vessel type. 7. Vessel waste management shall be charged for separately in accordance with a separate Waste Management Tariff. 1. Charges for passenger vessels and combined passenger and cargo vessels calling at the port for the purpose of embarking/disembarking passengers are as specified for cargo vessels. 2. Passenger vessels operating on a regular service but calling at the port without embarking or disembarking passengers are eligible for a 50% discount on the regular charge. The rate of discount for vessels remaining in the roadstead is 75%. The minimum charge, however, is €159.78. A passenger charge of €1.72 is payable for each arriving and departing passenger by passenger vessels in international traffic. If the vessel remains in the port and is used for temporary accommodation, the charge payable for each passenger is €1.72 per each day or part thereof. 4. The crew or other persons whose stay on board is connected with performing their duties. Tug-barge combinations referred to in Section 29 (2) of the Government Decree on Pilotage are charged for on the basis of the combination’s total net tonnage. Vessels calling at the port for maintenance or crew changes but not loading or unloading cargo and/or embarking/disembarking passengers are eligible for a 50% discount on the rates specified in Section 2 above. The minimum charge, however, is €125.40. Charges for dismantled vessels and vessels used for storage shall be agreed separately between the shipping company and the Port of Hanko. Length under 20 m: €25.50 incl. VAT. Length over 20 m €35.70 incl. VAT. Ship-generated domestic waste must be sorted as instructed. Designated containers for each type of waste can be found on the quays. The domestic waste management charge is not levied from vessels that have entered into a waste management contract under which they see to their own waste management. If a vessel violates the agreement and leaves domestic waste at the port, the vessel/shipping company shall be charged double the amount payable for unsorted waste. The charge is based on the net tonnage of the vessel. The amount payable is calculated by multiplying the unit rate by net tonnage of the vessel. Vessels calling at a Finnish port must send an advance notification of ship-generated oily residues to the port in accordance with the form authorised by the Finnish Maritime Administration. The notification must be submitted no later than within 24 hours before arrival or, if the voyage takes less than 24 hours, on departure from the previous port. All vessels calling at the port must pay the charge regardless of whether they deliver any oily residues at the port. However, vessels granted an exemption by the Finnish Maritime Administration from the mandatory delivery of ship-generated waste will not be charged for the reception oily residues. In case a vessel that has been granted an exemption from the mandatory delivery of ship-generated waste wishes to deliver oily residues at the port, the waste management charge shall be payable at a rate corresponding to the real costs plus an additional 20% general rate. If a vessel failed to submit the advance notification and still wishes to deliver oily residues, the waste management charge shall be the real costs plus an additional 20% general rate. If the amount of oily residues exceeds the amount stated in the advance notification, the additional costs charged shall be the real costs plus an additional 20% general rate. If due to reasons attributable to the vessel, the average pumping speed of the oily residues is slower than 2 tonnes per hour, the charge for the additional pumping time shall be the real costs plus an additional 20% general rate. If the pumping of oily residues is delayed due to reasons attributable to the vessel, the port shall not be liable for any additional costs arising from such delay. If a delay attributable to the vessel results in the vessel having to be moved to another quay for further pumping, the vessel/shipping company shall cover any costs arising from such move. The reception charge for cargo vessels for oily residues is €0.20 per net tonnage. The maximum charge is €880.00. The charge for reception and handling cargo residues and hazardous waste is the real costs plus an additional 20% general rate. The hourly rate is based on the heaviest container lifted during each hour. The Sunday rate also applies to any periods worked on Saturdays and eves of public holidays between 18.00 and 24.00. Outdoor storage charges to be agreed separately. The storage charge for the cargo discharge field is 0,55 €/car. Invoicing is done by manifest information. If the cars are not moved within 10 days the charge will increase to 0,45 €/car/day. The amount of cars that has been on the field for more than 10 days have to be reported every day from that day forward. If the reporting is neglected or done falsely the charge will be additionally 10 €/car/day. The Port is not accountable for outside vandalism on cargo units such as cars, trailers, containers or other cargo within the port area. The Port is not accountable for the lack of space on the port´s discharging fields. The companies and operators working in the port must make room for new cargo on the discharging fields. The Port is not accountable for missing pictures due to e.g. maintenance, breakage of the apparatus, updating or blackout caused by some other factor, but no fee will either be charged for the time in question. 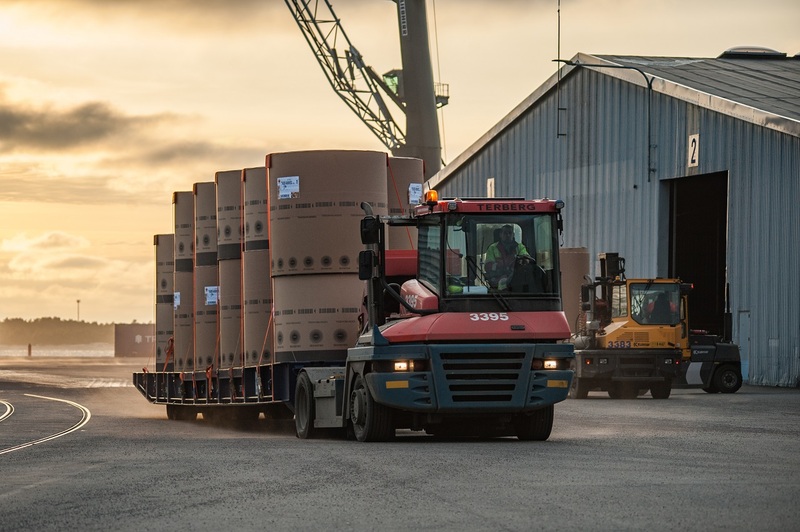 According to the regulation, units containing hazardous goods are not to be stored in the Port of Hanko, rather transported onwards within 24 hours. If the conduct of transport deviates from this, the Port of Hanko is to be informed well in advance before the unit arrives to the port. No charge of the unit for the arrival day and the following day. A 12 % handling fee will be charged on top of the actual costs. If the unit, which is being shipped / discharged deviates in measure or weight from ordinary transport units (special transport), the operator must ask for a special transport permit from the management of the harbour before the unit arrives to the port. The operator must ask for a separate offer for the harbour dues for the cargo. The offer must be accquired from the management of the harbour well in advance before the cargo arrives to the harbour area. The consumption of electricity and transfer thereof will be charged according to the meter reading. In addition to this the Port of Hanko charges a 20 % cost for use of the electric network. This cost is based on the costs mentioned above. For real-estate the consumption of electricity and transfer thereof will be agreed upon from case to case. In case there is no meter on the location, the orderer will pay for all costs caused by acquiring a meter and the installation thereof. The consumption of electricity and transfer thereof will be charged according to the tariff for temporary users of the electricity supplier. The tariffs are checked twice per year.